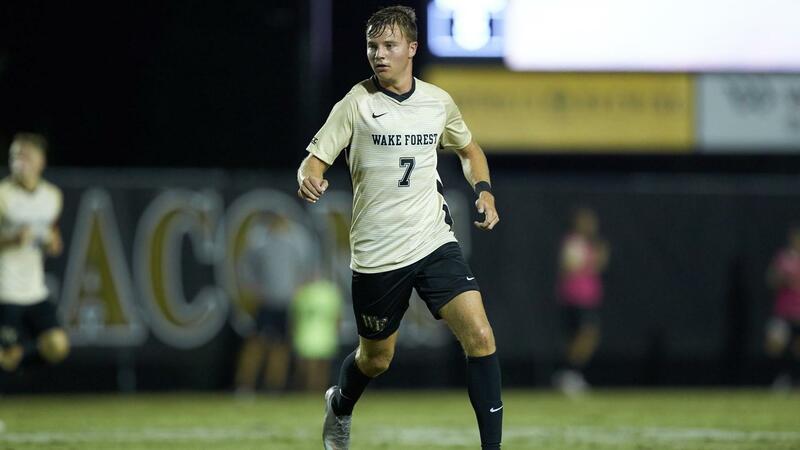 No.1 Wake Forest men’s soccer progressed to 9-0 on the season in their 5-1 win at home against Davidson on Tuesday night. While the game was tied 1-1 going into halftime, the Deacs came out of the locker room electrified, and maintained this energy for the entire second half of play. In this match, it was Wake Forest’s highly-talented freshman class that was able to establish this win with their combined three goals and pair of assists. “I am really proud of the work these freshmen guys have put in, whether it’s coming back from injury or breaking into the lineup to earn big minutes,” said senior captain Sam Raben. The first goal of the match was scored by freshman Aristotle Zarris in the 18th minute of play. Senior Logan Gdula fed Zarris the ball on the ground off of a cross coming from the right side, just outside of the box. Zarris was able to take a touch to settle the ball, and fire it into the back of the net to put the Deacs ahead. The Wildcats (4-4) answered back just one minute later when Stefane Zemmali headed the ball off of a corner kick for the equalizer. The second half was the true turning-point. Freshman Holland Rula established the momentum for the half when he scored in the 52nd minute. Rula received a pass from another rookie, Freshman Isaiah Parente, at the top left corner of the box. Rula fired a shot into the top right corner of the goal that Davidson goalkeeper Sawyer Gaffney could not reach. Lapa scored two consecutive goals to follow Rula’s lead. His first came in the 77th minute off of a penalty kick after he was tripped inside of the box right in front of the goal. This increased the lead to 3-1, while also noticeably boosting the team’s confidence. Lapa was not satisfied with just this penalty kick goal. He scored another less than 10 minutes later when redshirt sophomore Tater Rennhack fed him a long through-ball on the ground that split the defense. Lapa was able to settle this ball, look up, and beat the goalie with a well-placed shot into the left corner of the net. Freshman Koby Carr scored his first career goal with only 16 seconds left of play to end the game 5-1. The Demon Deacons will have three days to prepare for their big matchup against No.15 Duke on Saturday night at 7 p.m at Spry Stadium. “We need to continue to work on our ball movement and limit little mistakes in order to come out with a win against a good Duke team,” Lapa said.